Over the weekend, I was reminded a bit about what initially drew me to the field of webcomics in the first place…there’s just something relaxing, if not cathartic, about just having fun on the page (web or otherwise). I do like going for something a little heavier on occasion, but a significant appeal of doing this is in the noble act of being silly. I guess it hit me once again as I was drawing tonight’s comic about stupid-looking Tetrominoes being petty with each other. It’s the sort of thing I’d draw in a notebook, snicker, and wonder if anyone else’s sense of humor is distorted enough to possibly find it funny. 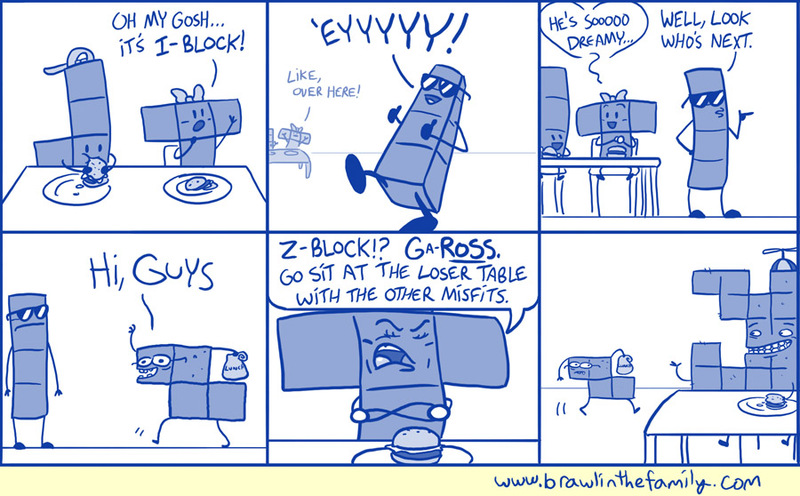 That Z-block IS annoying, too, although I almost feel bad for him here. But not enough to forgive the countless Tetris games he ruined. At any rate, thanks for the continued support! The past weekend was great fun, and next week, I’m goin’ to E3! Barring some major issues, there should still be the usual pair of comics next week, along with updated impressions from the show floor! If you happen to be going and care to meet me, I’ll be buzzing around the Nintendo booth for most of the show, wearing a badge with our company name (“BitFinity”).